Rebecca Potosky started competing in agility in 2009 with her Cavalier King Charles Spaniel, Gracie, and quickly became addicted to the sport. Rebecca grew up in 4-H, showing livestock; and while she bred and raised many champions, it was always the showmanship ring she loved the best. Showmanship strips you down to one thing, how you handle your animal, and it was that bond and close relationship that you form with your showmanship animal that Rebecca loved. Rebecca found that again in the sport of agility. UKI US Open and won the bronze medal for the Masters Series. In addition, Rebecca & Gracie have competed at the Westminster Master Agility Championships the past three years, making finals each year and placing 3rd overall twice! In addition to agility with Gracie, Rebecca has two young Miniature Australian Shepherds, Crickit & Gypsy, she enjoys training and playing disc (Frisbee) with. All four love to be outside hiking and enjoying nature when not competing! Rebecca believes in bringing the best out of a dog by using positive reinforcement and building drive for the game, making agility fun for both you and your dog! Diane Goodspeed - After ten years of training dressage horses, Diane switched to training dogs in 1992. Her first obedience dog was a Lhasa. In between having babies, Diane and Sandy completed their AKC UD and attended two Pupperoni Eastern Regionals. With their obedience titles complete, Sandy and Diane took up agility for fun and Diane was soon hooked. Her first Border collie, Kayla, earned her CDX quickly so they could focus on agility. Kayla earned her AKC novice agility title in April of 1999 and completed both excellent titles eighteen months later, qualifying for the 2002 Agility Nationals where they finished 30th. Kayla earned her MACH in 2002, completed her UD a year later, and then moved full time into herding. With Kayla retired from agility and happily chasing ducks around the backyard, Diane got her first sheltie, whom the kids named Demon. The little sable sheltie was a surprise birthday present from Diane’s husband, Richard. After a few years of training hiccups and bobbles, they quickly became a competitive force in the 16” division on the East coast. In 2009, they finished 3rdat the AKC Nationals and in 2010 they won a spot on the AKC World Team heading to Germany. With two clean rounds, they finished a solid 15thin Individual medium dogs in their first international competition. In 2012, they competed in Sweden at the European Open were they qualified for both Individual and Team finals. In 2013, they again won a spot on the AKC International Team. At the European Open in Belgium, Demon and Diane put down a clean round in the medium dog Team Finals helping USA1 - Medium finish 7th. Demon retired from agility after Belgium and moved onto doing nosework. Diane is now working with two shelties, Bazinga and Bizzy. The youngest of the team, Bizzy, finished 3rd at the US Open in 2015, qualified for the 2016 AKC Ntls and earned a spot on Team USA going to the European Open in France in July 2016. He then followed up with a spot on the 2017 EO team that went to Italy and was the medium alternate for the 2017 AKC World Team. 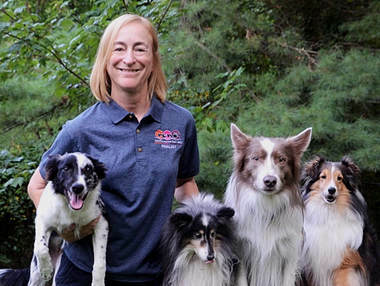 Working with many different breeds – Lhasas, Labradors, Lagato’s, Shelties and Border Collies – has given Diane a unique perspective on training and she has developed her skills as a competitor in multiple sports at different levels. 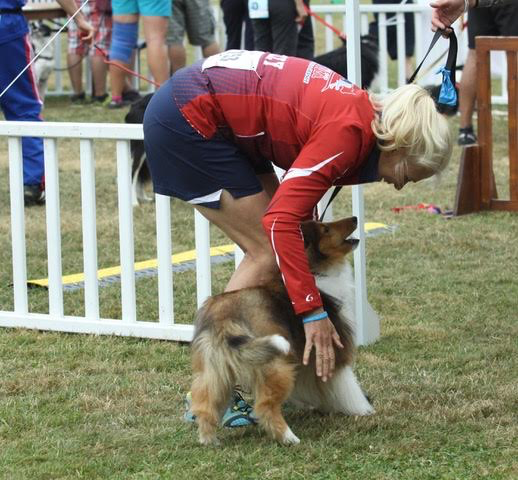 She understands how to have fun with her dogs while competing at the highest levels. Sally Gichner is one of the most experienced trainers and competitors in the Southern New Jersey area. She has been teaching all levels of agility for over 18 years. Sally has worked with a large variety of dog breeds, including terriers, hounds and mixed breeds. She spends time figuring out how your dog will best learn and enjoy the sport of agility. Sally is also an AKC and UKI agility judge. This has given her great insight into training dogs to be able to learn the skills needed to excel in competition. Sally currently competes with two Border Collies. Hank is a very consistent qualifier and usually placed in the competitive 20" class in AKC. Hank finished fifth at the AKC Nationals in 2017. Hank now competes in the 16” preferred class. He is very close to achieving his AKC Grand Chamionship Agility title which requires a dog to be able to work in a variety of classes. The dog must have distance, focus and the ability to perform complex sequences. Hank obtained MACH 3, AKC agility trial championship. Hank has shown that he can compete in other venues as well. He has obtained champion status in both USDAA and UKI. Over the last several years, Hank has earned byes to National events. E.V., Sally's other competition Border Collie has just started competing. Nova (Shetland Sheepdog) achieved agility championship titles in AKC (MACH5 & PACH) and USDAA (ADCh) and she was third at the AKC National Agility Championship in 2012. The USDAA title requires that the dog be able to perform in a variety of agility games that include distance, technical skills and the ability of the handler to plan a course that is better than the competition. Bridget (Shetland Sheepdog) has achieved agility championship titles in AKC (MACH2) and USDAA (ADCh) and has tried out twice for the World Team, placed at USDAA Regional Finals in Steeplechase and Grand Prix in 2011. Jeri Prekop has been involved in agility since 2000. Jeri likes to look at courses from a technical point of view so there will be an emphasis on course analysis in her classes. Determining the best path for the dog, setting lines, and choosing handling options that will minimize off-courses are integral for the most successful runs. There are many different handling choices to be made, and Jeri will help each team determine which ones that are best for them. Jeri is currently competing with 2 Shelties – MACH Cruise and Ditto, who are consistently in the class placements.